We are pleased to offer various benefits at our different levels of membership. See below. This membership entails enrollment into our monthly auto-giving program. Your commitment and gift each month are what help to grow and create consistency in our efforts to provide patient support as well as to fuel research and to effect real change by changing the Standard of Care for brain cancer patients. 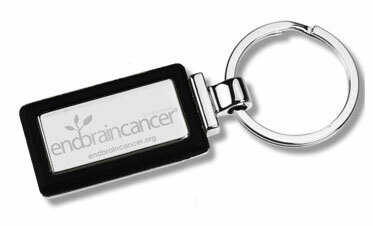 Please join our Membership Program to become a monthly member of the EndBrainCancer Initiative. This membership level supports the production of two personalized Patient Information Packets + the cost of mailing them out in snail mail directly to the patient/caregiver as well as supports the ongoing efforts to continually update these materials in both hard copy and on our website as well as update of files send out via email. This effort also helps to fund our one-on-one meetings with patients/caregivers/families. This membership level focuses on increased growth in our ability to service and provide free support to patients, their caregivers and their families. We currently have over 7,000 inquiries coming into our brain tumor Patient Support Services & Call Center each month and with this level of support, you are giving us the ability to respond to more and more of these inquiries for information as well as their requests to be directly connected to a top brain tumor specialist. Annually, we recognize you as a KEY facilitator of and funder of our “Direct Connect” Program in print and on our website. In addition, this membership level receives 2 tickets to our annual May Luncheon and receives 2 golf spots at annual golf tournament and is listed on our website as a “Direct Connect” program funder. Your funding facilitates our ability expand our Direct Connect program, connecting patients to top specialists and research. Pubic recognition on website as a “WOW! Factor” contributor as well as in our annual letter that goes out to over 30,000 people within the brain tumor community and nationally. In addition, this level receives 5 tickets to our annual May Luncheon as well as 4 golf spots at our annual golf tournament. 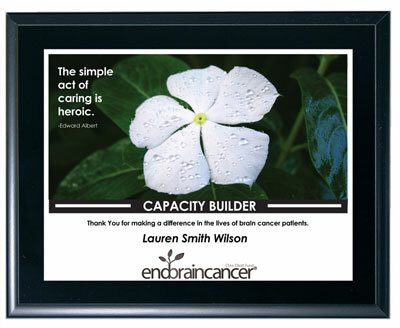 This membership level supports the entire EndBrainCancer Initiative/Collaborative. All of the above + Invited to attend as many events/speaking engagements, dinners/luncheons, conferences as possible with Leadership, Receive 2 tables at annual May Luncheon/Listed as Luncheon Sponsor at event, program/registration page and on website. Receive 2 foursomes at annual golf tournament, listed as Par Sponsor in program/registration page, website and mention at event. Listed on website under Donor GAME CHANGER and EndBrainCancer Initiative section. This level brings with it exclusivity and entails a private annual gathering of all members within this level, Significant Impact Member Level as well as the Catalyst for CHANGE membership level with our Board, Corporate Sponsors, Partners and other major donors. This level of membership directly supports all levels of the Phase 1 of the EndBrainCancer Initiative while directly enhancing the # of brain tumor/brain cancer patients entering into clinical trials from 3% – 6% by 2021. In addition, the Catalyst for CHANGE member provides support for direct IMPACT so that by the end of 2025, we should see the # of brain tumor/cancer patients getting into clinical trials reach 10% or even more. This level of giving “fuels Phase 1” of the Initiative and “fuels research”, which will then lead to a new Standard of Care for this patient population. Personal and/or Corporate Recognition TBD on an individual basis as well as benefits received. In addition, this level of monthly membership donor is listed as a Partner not only on our website but also in all event programs as well as in our Patient Information Packets and verbally recognized at all of our events as well as at all events & conferences that our President & Founder speaks at annually as well as receives all of the above items noted under our Membership Levels. This level of giving also brings the opportunity to build out your vision related to benefits received as our way of conveying our sincere “Thank You” for your investment in our EndBrainCancer Initiative and our vision to accelerate research and ultimately, to change the Standard of Care for this disease into an effective one that CURES and provides HOPE. 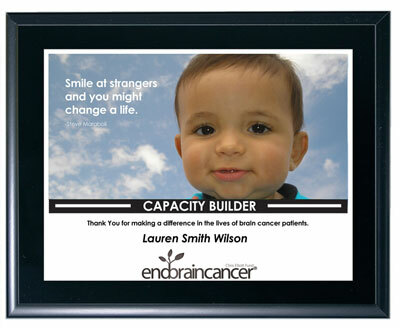 To Become a Member Email Us at wecare@endbraincancer.org and someone will get in touch with you.